The literature world may never be set on fire by this genre, but there are still several books on clubbing and club culture that are worth getting your nose into. It’s no secret that drugs and clubbing have gone hand in hand for many years. Never has this combination been more powerful than when acid house and Ecstasy joined forces in the 1980s. Matthew Collin writes in glowing, nostalgic terms about this time. He has been criticised for rose tinting the culture and this book does have a feel-good factor about it. 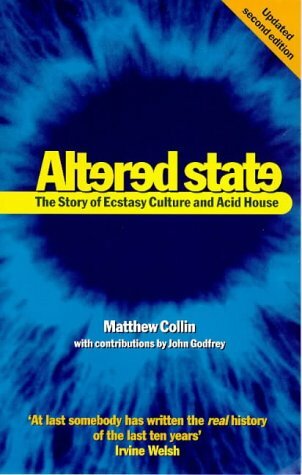 Reading ‘Altered State’ will, depending how old you are, make you want to get back to the warehouse parties or wish you lived through it. If you are involved in the scene, the lessons from those early days are important to note. Since the late nineties (when it was written) times have moved on again and dance music doesn’t occupy the national obsession quite as much. Nevertheless, it’s not to be missed as a smile-along account of some of the most important historical events in club culture. If you have not read it, why not buy it from Amazon? If you have read it, what do you think?